The Amalfi Coast is one of Italy's most spectacular stretches of coastline and one of the top romantic places to go. The Amalfi Coast begins at the village of Vietri sul Mare (from where this photo was taken), just west of the city of Salerno. If you're looking for ceramics and pottery, Vietri sul Mare is a good place to shop. Trains from Rome or Naples stop in Salerno and from there the coast towns can be reached by bus or in summer, by ferry. You can also drive along the coast but be prepared for a narrow, windy road that's often crowded. Let's take a look at the top towns to visit. You can see their locations on our Amalfi Coast Tourist Map. 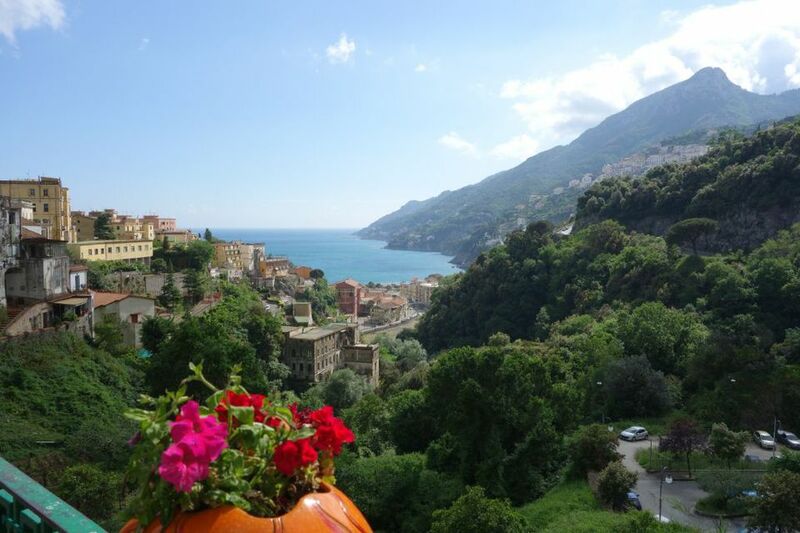 Gillian Longworth McGuire, author of Amalfi Coast Travel Essentials E-book, shares her suggestion for an authentic holiday destination, the town of Minori. Positano and Capri might get all the attention with their dramatic beauty, star sightings and high end shopping, but there is a little town just a few bends along the famous Amalfi Coast drive that is worth a visit. Like it’s much larger neighbor Amalfi, Minori was once a powerful shipbuilding center centuries ago. Now the town has a quiet old fashioned charm. There is a small beach where you can lounge under an umbrella during the day and In the evening the seaside boardwalk is busy with the traditional passeggiata or in mid July, summer celebrations of the town’s patron saint of Trofimena. A stay in Minori is like stepping back in time to the Amalfi Coast of decades ago. Minori is less Hollywood glamour and more authentic Italian holiday destination. The town is also well known as a gourmet paradise. Make sure you stop for a pastry or gelato at Sal di Riso’s famous shop in Minori’s main piazza. For the history buff, don’t miss the first century Roman villa with it’s Pompeii style frescoes and intricate mosaics. Villa Primavera is a bed and breakfast run by an Italian-German family with two conservatory musicians. Palazzo Vingius, located at the end of the town's promenade, has wonderful views of the sea. Amalfi was once one of the four powerful Maritime Republics (along with Pisa, Genoa, and Venice) but now its a charming town at the heart of the Amalfi Coast. Built on the cliff, narrow streets lined with shops and restaurants wind up from the beach to the top of the town. Amalfi has a lot of history and you'll see medieval architecture, an impressive cathedral decorated with mosaics, the Cloister of Paradise, and some of the best beaches on the coast. Amalfi is famous for hand-made paper and you can learn about its history at the Paper Museum and explore the Valley of the Mills outside town. Every four years the Regatta of the Ancient Maritime Republics with historic boat races and a parade is held in Amalfi. Monastero Santa Rosa Hotel and Spa is a luxury hotel in a restored monastery overlooking the sea, a few miles from Amalfi (read review). 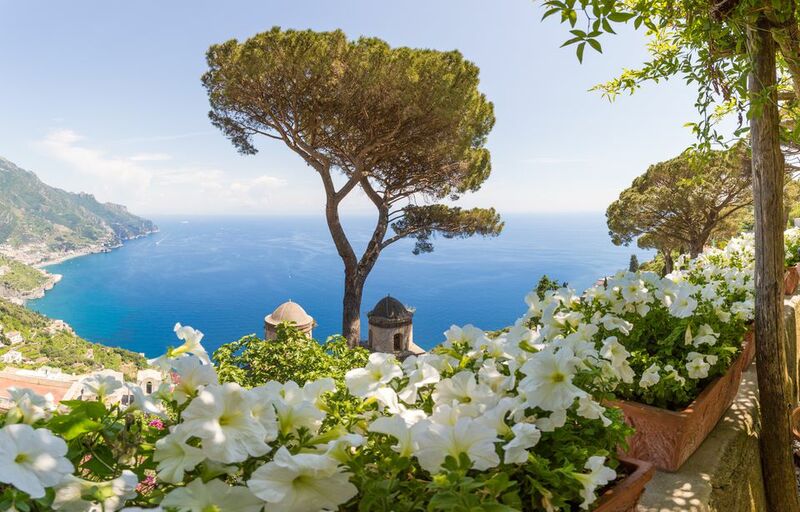 Ravello is a tourist town in the hills above Amalfi with fantastic views and beautiful gardens and villas. Visit the 13th century Villa Rufolo with its exotic gardens overlooking the sea. The town is known for its summer music festival, Ravello Festival, with concerts, dance performances, and art exhibits held in venues in town. The Ravello Concert Society holds performances from April through October, most of them at Villa Rufolo. If you're interested in cooking you can spend a day in Mama Agata's Kitchen at her cliff-top home and gardens overlooking the coast. Praiano was a small fishing village that's now a seaside resort. Nestled below the cliffs, Praiano is more spread out than most of the other towns, stretching along the sea. Visit the Church of Saint John the Baptist with its 12th century majolica tile floor and the 12th century Church of Saint Luke. Near Praiano, in the village of Conca dei Marini, you can take Select Italy's Limoncello Tour & Tasting: Magic Lemons of the Amalfi Coast including a visit to a lemon grove, making limoncello liqueur, and lunch. There are many hotels built into the cliffs, usually with good views and elevators connecting to the sea. Here are a few well-rated hotels in Praiano. Positano is probably the most famous and popular town on the Amalfi Coast. The colorful town rises up the steep cliff above the sea and is accessed mainly by pedestrian-only walkways and winding staircases. A bus runs on the main street between the beach and the top of the town. Positano is known for its high-end shops and artisan shoemakers. Below the town are sandy and rocky beaches and the sea here is great for swimming. Ferries run from Positano along the coast and to the island of Capri. From the top of the town, you'll have great views. Positano is a starting place for several Amalfi Coast Guided Tours and outside town are good hiking trails, both along the coast and in the hills.